The Sea Hawk, as part of the Fleet Air Arm, saw extensive service during the Suez Crisis, initiated by Egypt's nationalisation of the Suez Canal. The United Kingdom, France and Israel took part in the campaign, with the Anglo-French invasion being known as Operation Musketeer, beginning on 31 October 1956. Six Sea Hawk squadrons took part: two were aboard the fleet carrier HMS Eagle, and two each aboard the light fleet carriers HMS Albion and HMS Bulwark. The Sea Hawks were used in the ground-attack role, in which they excelled, causing immense damage to a variety of Egyptian targets. The military aspect of the Suez Campaign was a very successful operation, unlike the political outcomes. All Allied forces were eventually withdrawn by 1957. The Sea Hawk was a successful export aircraft. In the Royal Netherlands Navy, it served aboard the Dutch aircraft carrier HNLMS Karel Doorman, ex-HMS Venerable, including decolonization operations guarding against Indonesian threats in the area. In 1964, the Sea Hawks that served on her were moved ashore when the NATO mission profile was changed to all ASW aircraft. When Karel Doorman was sold to Argentina they were quickly taken out of service. In Indian Navy service (beginning in 1960), Sea Hawks were used aboard the aircraft carrier INS Vikrant, ex-HMS Hercules, and saw service during the Indo-Pakistani War of 1965 and the Indo-Pakistani War of 1971. The latter war saw Sea Hawks being used very effectively by the Indian Navy; these aircraft racked up nearly a dozen "kills", mainly of Pakistan Navy gunboats and Merchant navy ships and cargo ships in East Pakistan (present day Bangladesh) without losing a single aircraft in the war. Aided by Breguet Alize aircraft, the Sea Hawks emerged unscathed, achieving the highest kill ratio for any aircraft in the entire war. The Sea Hawk was withdrawn from Indian Navy service in 1983, being replaced by the far more capable BAE Sea Harrier. Following trials it was found that a larger fin/rudder and tailplanes improved low speed handling. This resulted in the Mk.100/101 which were sold to Germany and to India, who really liked the Seahawk and operated both tall and original tail versions. I would not doubt that many German planes also found their way to India. Back in the olden days, Airfix produced a very simplified version that had all the shapes right, and was well received by the pocket money crowd of the day. Aeroclub produced some upgrade parts for it so that it could be made into a more presentable model. Not that long ago, MPM/Special Hobby did several boxings with their usual addition of photo etch and other bits in their short run line. This is the latest and may well be the best of the bunch as it provides all the detail most would want without having to rely on non-styrene substitutes (though I'm sure there will be aftermarket for it). 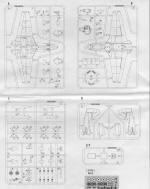 The kit is molded on four grey and one clear sprue with a superlative level of detail in the engraved panel lines. The forward fuselage pieces are split horizontally and include the full wings. The tail is vertically split and this allows for the later tall tail version to be kitted with minimal changes in the rest of the sprues. The cockpit tub is nicely detailed with a respectable seat as well as raised detail on the side consoles and instrument panel. A decal is also provided. Nicely molded intake and exhaust trunks are done with the little vanes for the intakes molded in place. There is sufficient room in the nose for weight as this one will probably need it. Wheel wells are fully boxed in and the correct shape. The arrestor hook looks as if it can be posed up or down. A very clear two piece canopy assembly is provided and is protected from scratches with bubble foam. For things under wings there are two drop tanks and eight rocket rails. The rocket bodies are molded onto the stubs with a separate tail fin piece. One needs to open holes for these items if one wishes to install them. I appreciate that Hobby Boss isn't already opening these holes and gives us the option to build a clean aircraft. 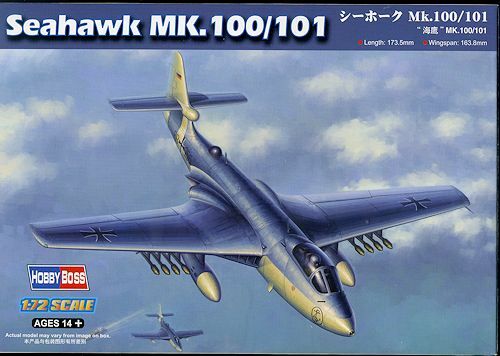 Where this kit differs from the earlier boxing is that it includes a sprue with a different rear fuselage and tailplanes to take into account the increased size of these on the Mk.100/101. Markings are provided for two planes and are almost disappointing in their lack of any really interesting markings. Both are in Dark Sea Grey over Sky and both are devoid of any sort of unit markings. Perhaps the 'plainness' is the reason this particular kit was on deep discount. 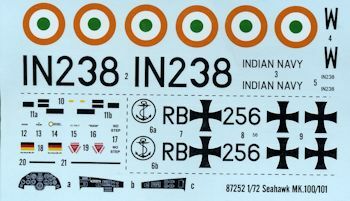 The decal sheet is very nicely printed and should work very well. 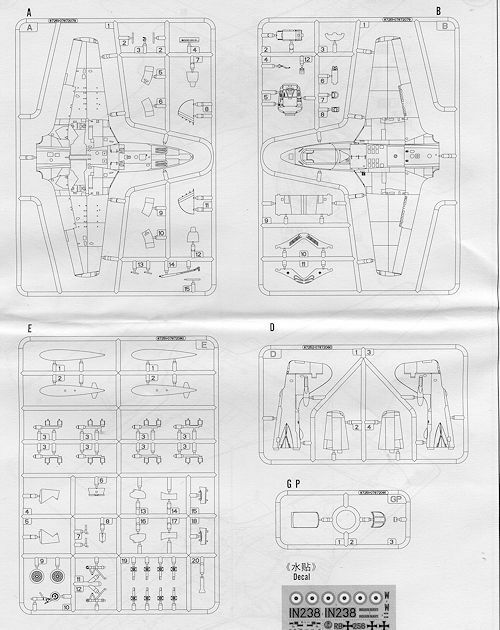 The instruction sheet includes Hobby Boss' nicely drawn construction steps and the full color markings guide includes several paint options. I should mention that the paint instructions call for dark sea grey on the uppers and this is an acceptable shade as the extra dark sea grey quickly weathered when exposed to the elements. I have seen photos of this kit built up and it looks very nice. It is very much superior to the Airfix kit and is probably a lot easier to build than the one from MPM. My thanks to me for spotting a bargain kit.